PROVIDING an up-close and in-person look into the latest automotive designs, new launches and technology, the four-day International Automobile Show was held at Expo Centre Sharjah in late November. Several new brands and new vehicles premiered during the show, offering visitors an opportunity to be among the first in the region to see what automakers have to offer in terms of design, technology, specifications, features, upgrades, future concepts and dealer offers. Some of the new brands making their debut at the show were Brabus, Porsche, Koenigsegg, Alfa Romeo, Dodge, SRT, Jeep, Lotus, W Motors, Peugeot, VKool, Chery, GAC and BAIC among other popular marquees. Visitors also had the chance to win an amazing prize – every visitor was entered into a raffle draw with a Jeep Wrangler Sport, courtesy Trading Enterprises and Fiat Chrysler, as the prize. The biannual International Automobile Show was inaugurated by Sheikh Abdullah Bin Salim Bin Sultan Al Qassimi, the Deputy Ruler of Sharjah. Present were Abdullah bin Mohammed Al Owais, chairman, Sharjah Chamber of Commerce & Industry; Saif Mohammed Al Midfa, CEO, Expo Centre Sharjah, other officials, dignitaries and industry representatives. 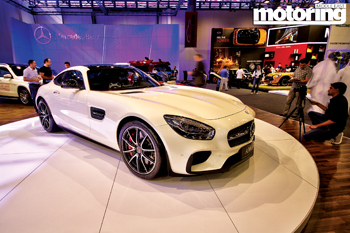 “The International Automobile Show will literally be your one-stop shop for purchasing a car. There is no need to visit several car showrooms, wait for test drives, etc. Just walk in, see all the models, compare, take test drives and book a car – all in a single visit and at a single place,” said Al Midfa. Dealers showcased brand new launches as well as the latest models that cover convertibles, concept cars, sedans, 4X4s, motorbikes, water vehicles and commercial vehicles, besides accessories, audio and video systems, navigation systems and other car care products and services. “The show is being held against the backdrop of a thriving regional car market. Car sales have been on the rise in the UAE since the past several years and are likely to see double-digit growth this year too. This has prompted all major car dealers to participate in the show and make the most of favourable market conditions,” said Al Midfa. More than 360,000 vehicles were sold in the country in 2013. Wassim Derbi, marketing manager, Gargash Enterprises, said the firm has been part of this international event for several years now. “It is an ecstatic experience and we are looking forward to delivering the best to automotive enthusiasts,” he remarked. This year it had three stands, each representing a product launch: The much awaited 2015 Pajero, the JAC S3 SUV and the J4. “Chery Arrizo 7’s debut was a big buzz among motoring aficionados in the UAE and we foresee great growth opportunities in both fleet as well as individual ownership categories.” said Joe Rogan, sales director of Al Habtoor Motors. KT Govindarajan – president, V-KOOL (Kapico Group), the official car care partner at the show, showcased state-of-the-art window tinting and car care solutions. The show also lined up a series of on-site activities to assist buyers in choosing their vehicles and testing them, including a test drive track and a 4x4 track. There were car audio and car modification competitions, apart from a classic car display by the Sharjah Classic Car Museum & Club, which is home to 100 classic cars of different brands manufactured between 1917 and 1980.